Happy Wednesday everyone! 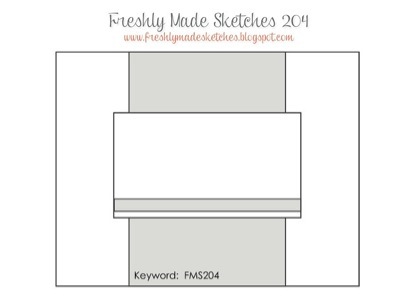 Welcome to our newest sketch challenge at Freshly Made Sketches. This week our sketch hostess is the wonderfully talented Jen Mitchell. I am loving this sketch! 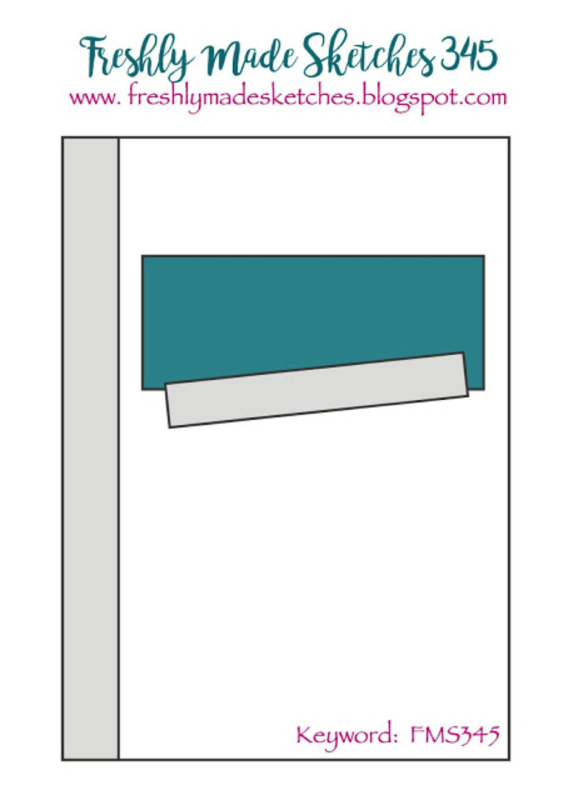 Especially that tilted panel! I chose the butterfly from Watercolor Wings to use on my main panel. 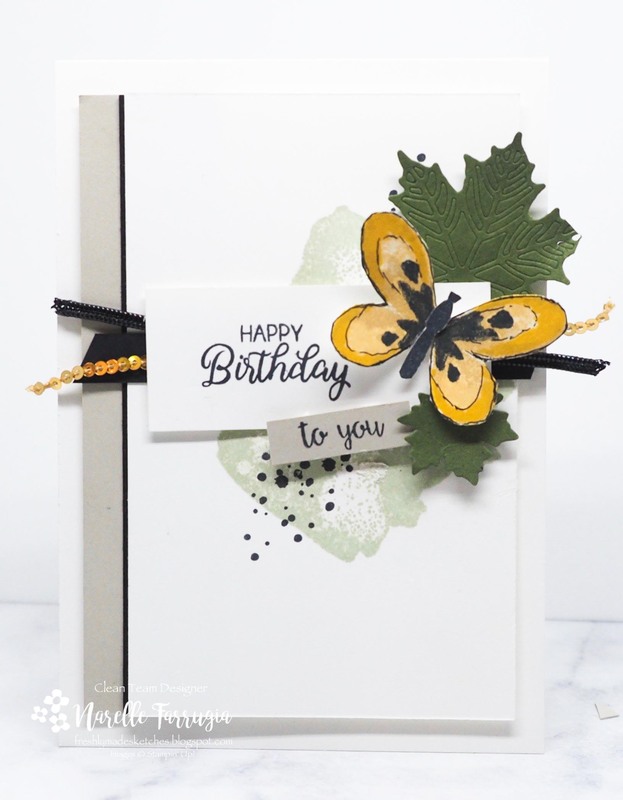 The butterfly is stamped in So Saffron, Crushed Curry, Basic Black and Crumb Cake Inks. I then took my Black Journalling Pen and added some definition lines around the centre of the butterfly. I had some leaves cut with my Seasonal Layers Dies Thinlits Dies sitting discarded on my desk, so I added them for extra layers. I added some Gold Sequin Trim and some Black Cord under my sentiment. For the background I stamped the watercolour type stamp in Soft Sea Foam. This stamp is from Love What You Do and it saves me time from having to watercolour the background myself – and I have to say it has a much better look than when I try it myself. I then added the ink splatters from Timeless Textures in Basic Black Ink. 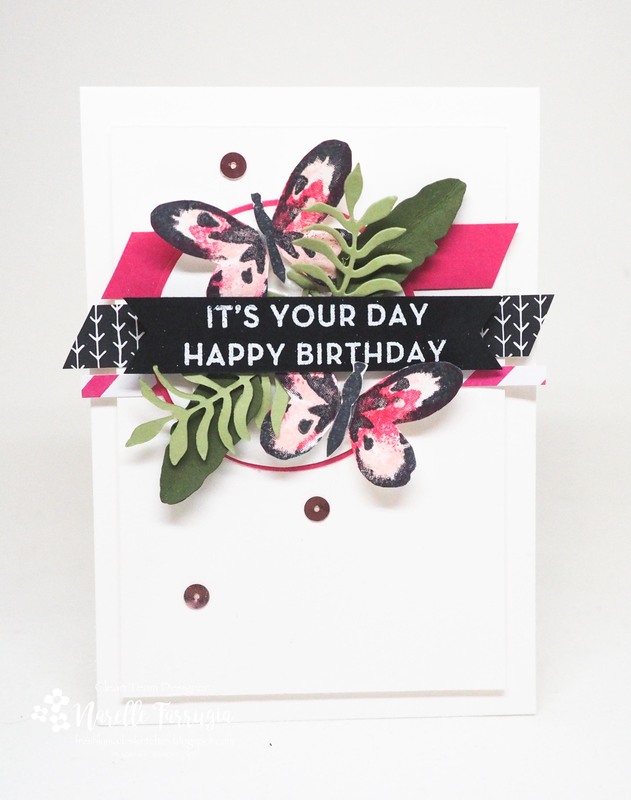 My “Happy Birthday” sentiment is Beautiful Bouquet and “to you” is from a set that I have just forgotten and couldn’t find in the limited time I had to write this post…. Come and join us for this challenge! The team at Freshly Made Sketches have created awesome inspiration for you. Head over to the challenge and take a look. This weeks sketch at Freshly Made Sketches has been designed by the wonderfully talented Kim Singdahlsen. 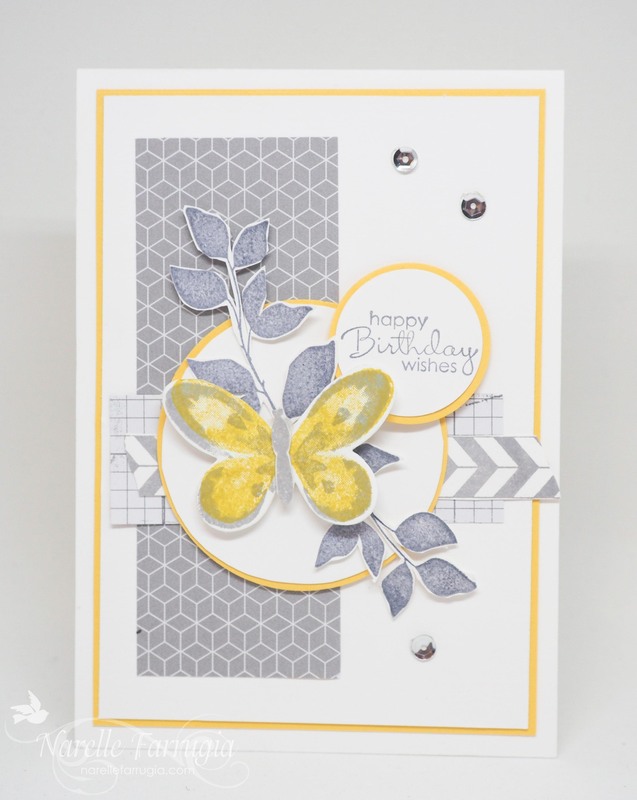 I totally love her cards – head over to her blog and check them out. It’s been ages since I inked up butterflies from Watercolor Wings so I used them on my card today. The colours I chose for them are – Melon Mambo, Blushing Bride and Basic Black. I’ve piled so many butterflies and leaves as well as a sentiment, you might not see my circle – but it is there. Head over to Freshly Made Sketches and see the fabulous cards the girls have created. Don’t you hate it when you’re on annual leave and you forget what day it is and you schedule your post for the wrong day? That’s me. Here’s my post for this weeks Just Add Ink Challenge. I LOVE this challenge. I can’t wait to see what all you very creative people come up with. I went pretty simple with wings because I don’t have a very big imagination and went with what first jumped into my mind. 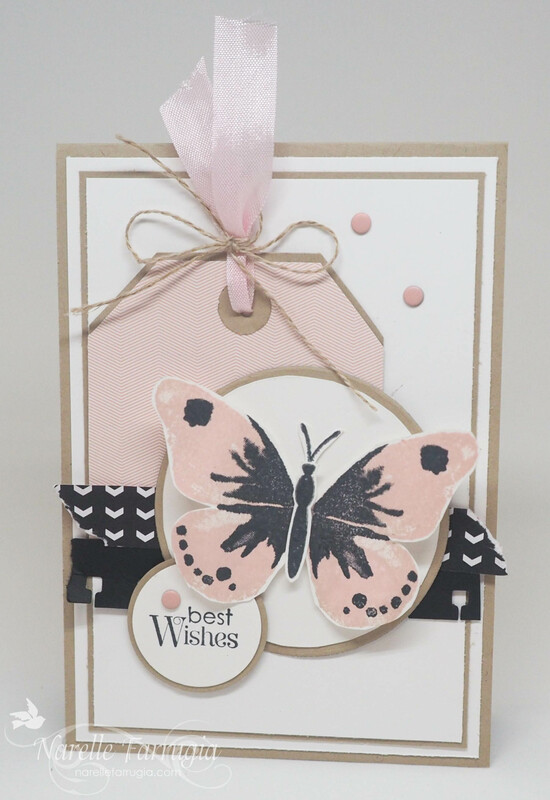 Stampin’ Up!s Watercolor Wings is a fabulous set and is really easy to line up the layers on the first go. I played around with colours to use for the wings and ended up with (in order of stamping) Soft Sky, Pool Party and Basic Black. The rest of my card came together around those colours. After my last messy effort of creating black linen thread, I learnt my lesson and this time I wore gloves. Come and join us with this great challenge. Head over to Just Add Ink and take a look at the projects the girls have created for you. It’s my mums birthday today so I created the following card for her in a style I know she loves – vintagey. 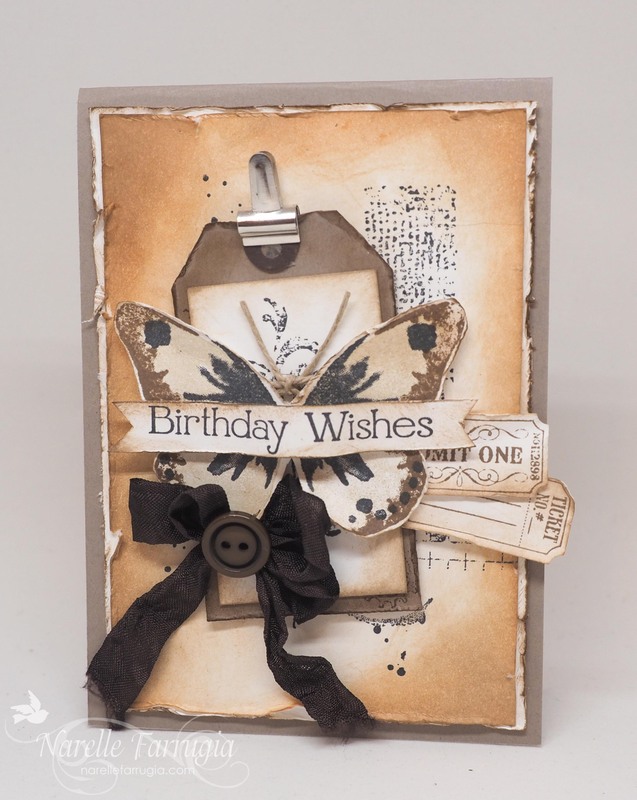 I’ve signed up for a Tim Holtz online class that starts in a few weeks time. I’ve previously signed up for two of his other classes and hadn’t watched a single video of his until yesterday, where I watched two. I tried to bring in a couple of things I learnt from the two videos I watched for her card, but in the end I think I just went with what I knew anyway. My mission will be to watch ALL of the videos in my next set of holidays. It’s time for a new challenge at Just Add Ink. This week our colour challenge was suggested by Kim. I am totally loving these colours. Lotsa layers on my card. Come and join in our colour challenge at Just Add Ink. Head over to the blog and be inspired by the wonderful creations the Design Team have created. You know what I love about being on holidays? I can take my time creating a card rather than being rushed on the weekend. I started this card yesterday and finished it off today. Lots of time to decide what colours and image I was going to use. 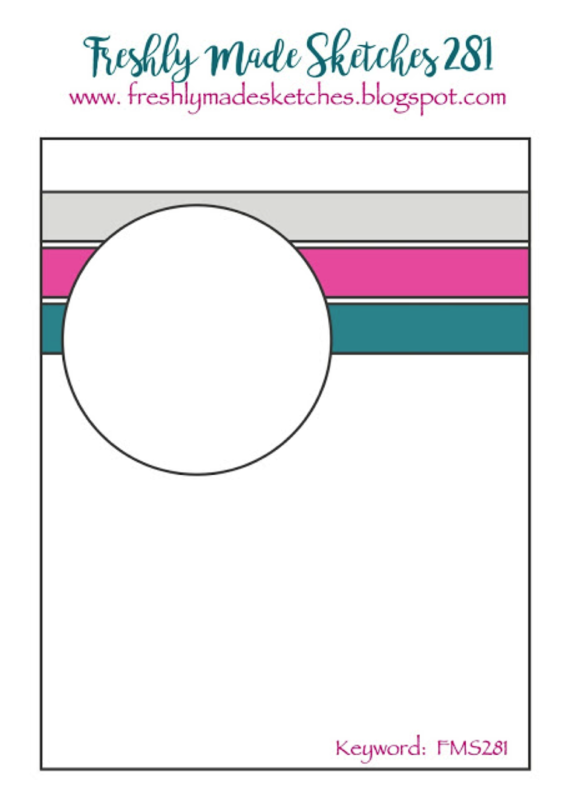 The card I’ve created today is for the sketch challenge at Mojo Monday. Here’s their sketch. It’s time for a new sketch at Freshly Made Sketches. Our wonderful sketch this week has been designed by the mega-talented Jennifer Timko. 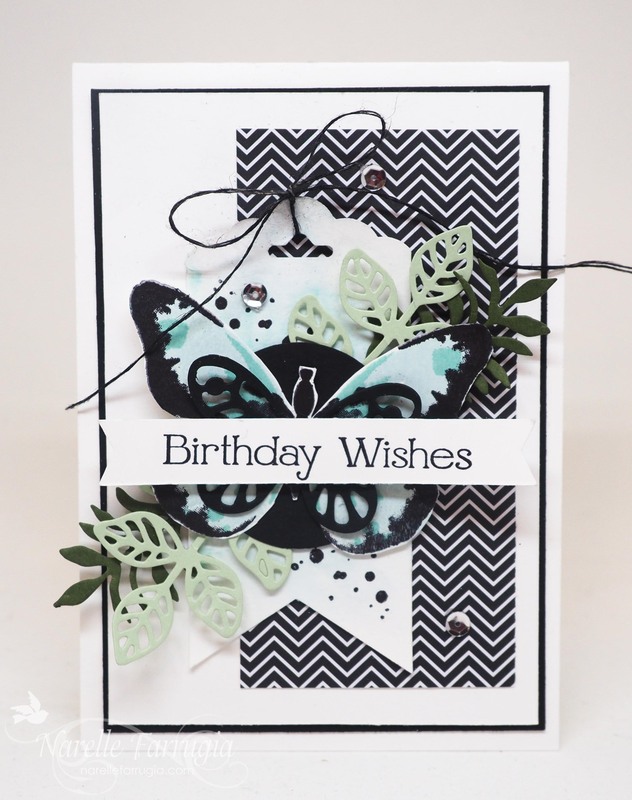 Head over to her blog and check out her fabulous cards! Our team has provided wonderful inspiration for you – head over to Freshly Made Sketches and check out their cards.